We’ve tried several methods of improving sandy soil. Sometimes, it takes a year or two after the improvement to see results. This soil has little iron in it. There is no humus. Corn won’t grow 3 feet high, tomatoes and peppers do not grow either. Great because it provides the quickest result. There were a lot of dead, lignified, grasses and plants (see the grey stuff). It took a few weeks to see the results. The next year found the ground looking even better. There were downsides. This method does little to hold water (and nutrients) in sandy soil. It does help, but true sealing doesn’t happen. Next is amendments. No pictures because I haven’t done this. Amendments are great if you’ve done soil tests and know what you need. (see cheap soil test post) The cons are that you don’t get soil that holds water, and those nutrients will leach away eventually. If you have topsoil, amendments like lime or basalt dust may be what you need. To get topsoil, I needed to keep water in the top 8 inches of the ground. I decided to use pigs. to try to seal the ground and fertilize it. You can see dirt. There is no topsoil. So, I let the pigs destroy all of the plants, dig up the rocks and generally create a moonscape. Some of the areas were seeded with orchard grass and fescue. Others weren’t. 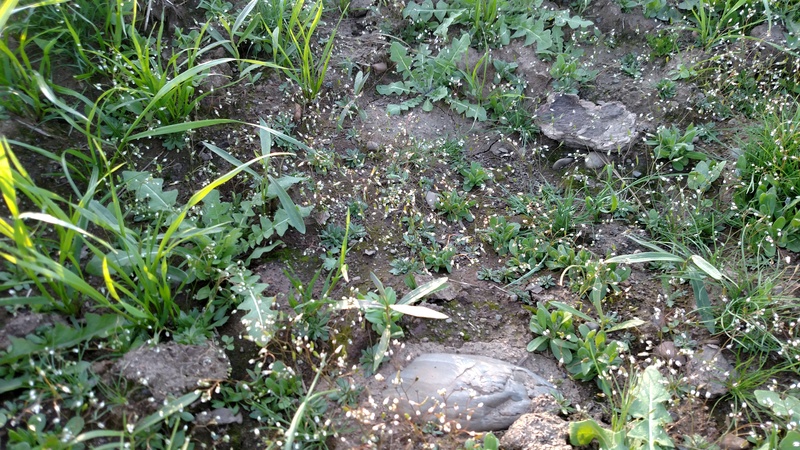 Within a month, the pasture was showing signs of having sealed ground. The wallows were first, but then the impact spread. I saw no signs of improved plant growth though. 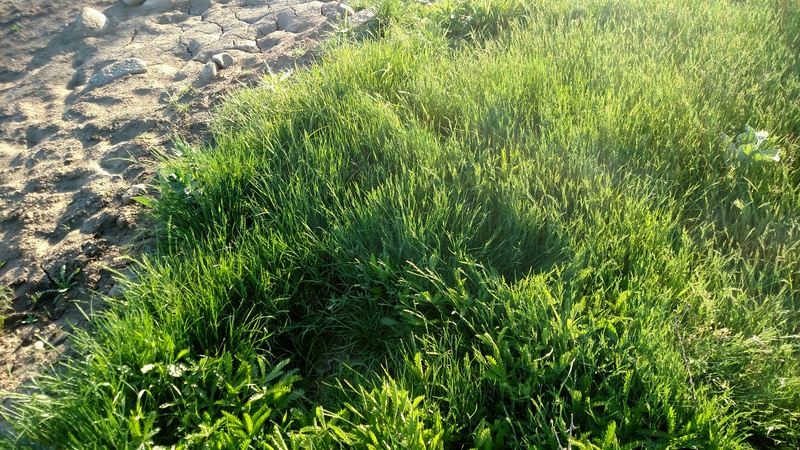 All of this grass (see above) was adjacent to a seeded area–the grass is spreading into the moonscape that hadn’t been seeded. Also, note the cracks in the bare ground. This ground is no longer sand. It is sealed. The pasture held water for a month longer than the surrounding ground. The left side of the pic below is dark because there’s still moisture on the surface, even in a relatively bare spot. Additionally, areas outside the pasture benefit. 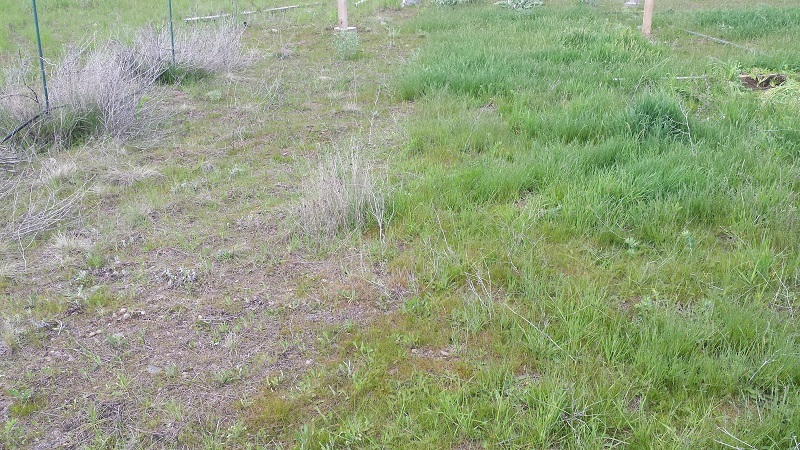 The picture below shows soil improvement at a gate on the outside of the pasture. This area was not seeded and I would have expected the soil to be impacted and too hard for real growth. 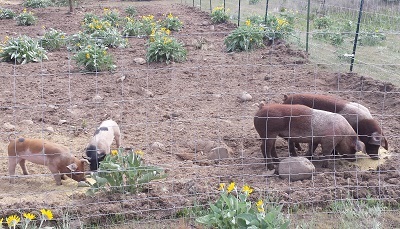 If your soil drains too easily, then use pigs to seal it. Once your soil can hold onto water, do soil tests. If you do not need amendments, you may want to consider chicken tractors to build natural, quick acting fertilizer into your ground. 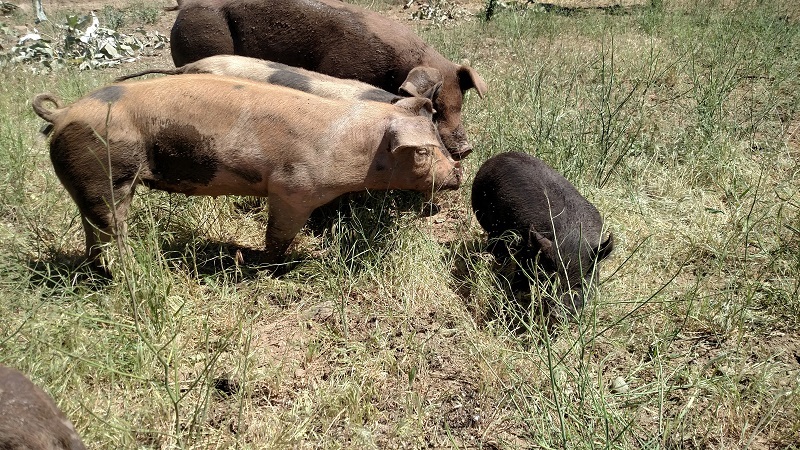 Pig manure doesn’t fertilize the ground quickly. The results are spectacular once it takes effect.